Day 4 of my tour of the Santa Rosa Mountains found me south of SR74, spending the night in the back of the van parked at the Morgan Trailhead along South Main Divide Road (also known as the Killen Trail). There were a surprising number of vehicles passing by through the night, along what I thought was a lightly-used road. I didn't realize there was a small community located further south along the road that helped draw traffic in that direction. The day's goal included a couple LPC peaks that would keep me busy for half the day. I needed to give the legs a bit of rest for the LA marathon I was running with my sister the following day. I probably shouldn't have gone hiking at all today, but truth be told I'd rather be out hiking than running a marathon with 25,000 of my not-so-closest friends. 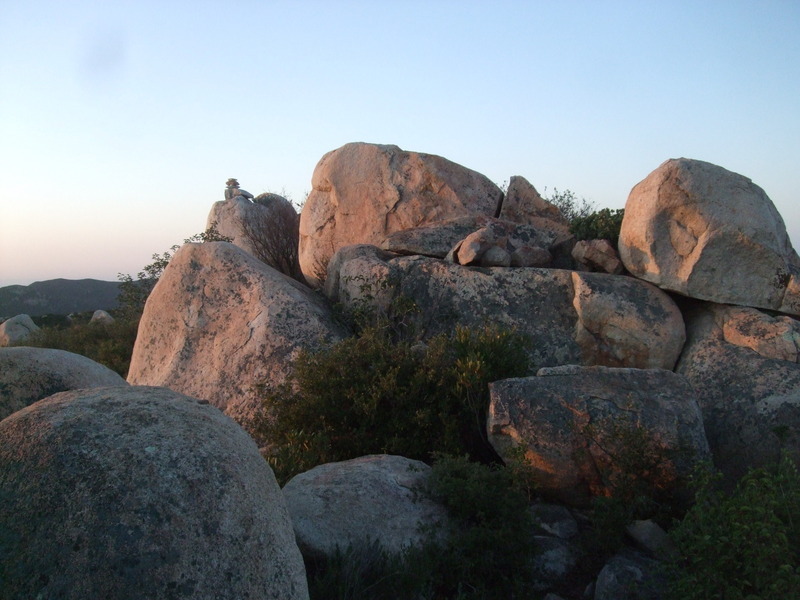 First up was San Mateo Peak, an unofficially named summit that happened to be the highpoint of the Elsinore Mtns, a difficult-to-define subrange in the southeast corner of the Santa Rosa Mtns. The route is largely described in the LPC guidebook, without which it would be nearly impossible without local knowledge. I was up at 5:30a and ready to head out by headlamp at 6a. I followed the Morgan Trail downhill past the TH register and then another 30-40 yards to a side trail, an unsigned equestrian trail that turns left and follows the small creek upstream. I followed this for a bit less than a mile, making the five crossings as described. The old road mentioned just before the 5th crossing was not evident at all (and not evident in daylight either, upon my return) which caused a bit of confusion. After about a quarter mile I found the trail junction described, though no cairn existed at this time. There was a wooden stake with a plastic dinosaur tacked to it (mentioned in the guidebook), and from here to the summit it was just a matter of following the nice trail up out of the creek and to the top a few miles away. The guidebook describes a "large rock with a duck on it" that isn't all that helpful. While the large rock is prominent enough and the trail heads right towards it, the duck atop it is located on the backside and not at all visible on the approach, and can only be seen once you are past it and on your way to the San Mateo summit. A second dinosaur marker is reached about a mile after the first, on the way up towards the large rock. There is a junction further on, still before the large rock, not described in the guide. A small shortcut appears to have been established since the guidebook was written and it is no longer necessary to hike up to the large rock. I took the left fork heading south which heads more directly to San Mateo. The sun came up shortly after 7a, a few minutes before I was able to reach the rocky summit at the south end of a short ridgeline making up the summit. There are fine views of the surrounding terrain, and one really gets a sense of how dense the chaparral on these hills is - cross-country travel is pretty much impossible. Gabriele Rau of the LPC had left a register dating to 2001, with a smattering of entries over the years. To the southeast I could see the antenna-topped summit of Elsinore Peak and it was then that I got the idea of visiting that summit upon my return. The peak isn't on the LPC list, but it's one of the few named summits in this wide area. I returned via the same route to the creek, noting by daylight there was a small collection of rocks that might be construed as a cairn where the first dino marker was found. Near the 3rd creek crossing I noted some side trails heading south and east and I decided to follow one of these rather than the original route I had taken from the Morgan Trail. I discovered a shortcut of sorts to an equestrian staging area about half a mile southeast of the Morgan Trail, alongside the road. This would cut at least half a mile off the described route if one were to start from this point. I walked the last half mile along the road back to the car where I arrived just before 8a. Back in the car, I headed south on the road another ten minutes until I was just west of Elsinore Peak. The road had climbed most of the elevation so that the summit looked like little more than a small hill off to the east. I attempted to drive the van along the side road to the summit, but the road deteriorated quickly and I had to back down off the heavily rutted road. I parked in a grassy flat along the road and hiked the remaining ten minutes to the summit. The highpoint was just east of the antenna installation and had been left unmolested, surprisingly. There was a locater benchmark here, but the triangulation benchmark looks to have been removed our plowed over at some time in the past. There was a decent view of Lake Elsinore and the Temescal Valley to the northeast, but haze was obscuring much of the view and the San Bernardino Mtns were just visible in the background. Back in the van once again, I spent the next 30 minutes driving back out to SR74 and then west to the Bear Canyon Trailhead. The large parking lot was perhaps half full with about 20 cars before 9a, suggesting it is a popular hiking and biking location. As it was Saturday, I was unlikely to find the solitude I'd found the previous three days in the area. And indeed, that was the case. I came across other parties almost from the start, passing in one direction or another perhaps a dozen groups. The Bear Canyon Trail climbs at a moderate grade out of the main canyon as it winds its way south and enters the San Mateo Canyon Wilderness. A surprisingly lush area is found on the north-facing slopes of the hills, some trickling streams, with ferns and other seemingly out-of-place flora amidst this typically dry chaparral. The trail junctions are nicely marked by slender white posts at each junction, making navigation to Sitton Peak fairly trivial. It took about an hour to reach the five-way junction known as Four Corners that sits atop the main ridgeline between two major drainages. I followed the route indicated for Sitton, hiking up and over a pass less than a mile later, after which I was able to see the peak for the first time (it is not visible from most the route). Hiking down to a saddle, the side use trail described in the LPC guidebook was easy to find with another white stake marking the location. A rather steep use trail took another twelve minutes to ascend to the summit. I found a couple lounging about the highpoint, so I took only a few quick photos before retreating back off, forgetting to even look for a register. They looked like they were hoping to have a bit more solitude, so I left them fairly quickly to head back down. They were unlikely to get much time alone, however, as two more parties were shortly on their way up as well. On my way back up to the pass before Four Corners, I took a side excursion up the slope to the north following a thin use trail. The LPC guidebook had described this as " Boy Scout Peak" which seemed good enough reason to pay it a visit. It was nearly as high as Sitton Peak to the west, but otherwise had nothing more to offer. No Boy Scouts were discovered at the summit. Back at Four Corners, I opted to take the slightly longer (by half a mile) Bear Ridge Trail for the return. As the name suggests it follows mostly along a ridge offering better views, but nothing sepcial to recommend it. It was 12:30p before I returned back to the van. Not having a valid Adventure Pass with me, I had left the citation I'd received the day prior under my wiper blade and was happy to find it still there without an additional one to complement it. The old ruse had worked. Or perhaps the ranger just hadn't been through the parking lot to check yet. The rest of the vehicles all seemed to be sporting the proper passes, likely they've been through the routine enough to know better than to take their chances. Perhaps someday I'll learn this lesson myself.